Who’s excited??? It’s been a while since I put together a mood board and possibly the best part of pregnancy is brainstorming decor! I had a few ideas floating around, but wanted to wait until we knew if we would be having a boy or girl. Well, it’s officially a boy! I wanted something fun and child-appropriate without being overly cutesy. Baby won’t have any opinions on decor for a while (if ever), so the nursery is really more for mom and dad. I also wanted to keep the basics of the room pretty gender-neutral so if we have a girl sometime in the future we can reuse our baby gear easily. 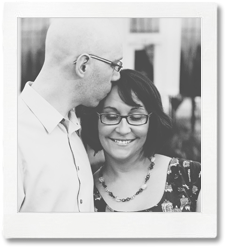 As I mentioned before, my starting point was a set of Zoo Portraits–fun and whimsical without being sickeningly cutesy. The ceiling fan I fell in love with early on and nearly talked myself out of it! Everyone thinks I’m nuts when I start gushing over a ceiling fan, but isn’t this one just fabulous? 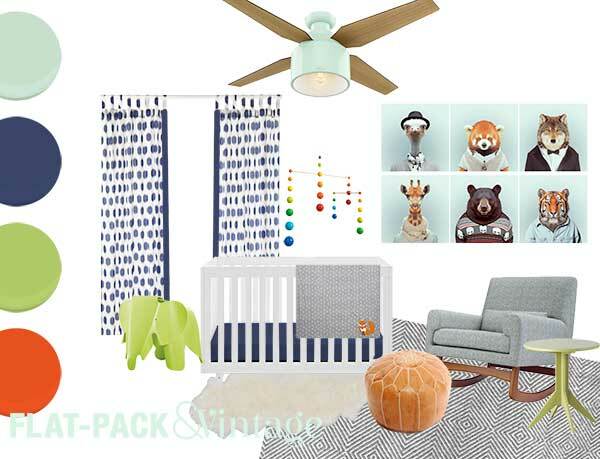 I didn’t want to fall into the muted, monochromatic trap that a lot of baby rooms fall into. Bold colors and high contrast are easier for a baby to focus on, so I wanted pops of brights, especially in the mobile. Plus, it’s just more to my personal liking. The lime and redish-orange I plan to work into some more accessories and storage pieces. My current thoughts on paint are to paint the ceiling the same minty-aqua as the light fixture and then go pretty neutral on the walls. I think by the time I’m done there will be a lot going on around the floor and walls that will be better balanced by a bolder ceiling. The Eames elephant probably won’t make it into the final room since it’s definitely splurgy, but a girl can dream, right? That is going to be one seriously adorable room. What a lucky kiddo! I think it’s a great idea to focus on things you love and not worry to much about the them.